Morley Vortrak 00/HO Controller for European and Eire customers, the price of £189.65 includes postage/shipping costs.Weight 3.7Kg. also "N" gauge version available. The Vortrak 00/HO controller is supplied with a Euro/Schuko 2 pin mains plugfitted. A UK type 13 amp plug is fitted for Eire. Other types of plugs can be fitted on request. For 'OO' and 'HO' gauge layouts. The Vortrak Four Track Controller has state of the art design, electronics and construction, producing the very best in performance and capability. Complete with two 5metre hand-held remote controllers. Ideal for multi-use i.e. Four main lines, two main lines + two sidings, three or three main lines with one siding etc. Allows you to shunt whilst the main lines accommodate the expresses etc. LSP fitted 'locomotive stall protection'. 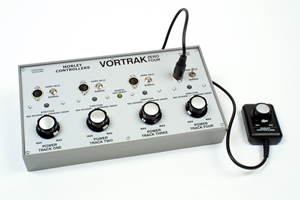 Unique to Morley, the Vortrak controller is designed with an on-board Heavy Duty Capacitor Discharge Unit (HD/CDU). When used with the correct switch it will activate the points motor, giving it a firm, positive, short burst of current, being of short duration it prevents the points motor from being burnt out. A "Points CDU ready" LED indicator is situated on the front panel. A points motor diagram is supplied. Centre off power controls, provide locomotive direction change, together with perfect smooth control at slow speeds, as well as fast. Two hand-held units each with a 5 metre lead are included, with centre off controls providing power control and direction change. Output connections are by Screw Type PCB terminal blocks. Desk type dark grey case with sloping aluminum front. The Vortrak 00/HO controller is supplied with a Euro/Schuko 2 pin mains plug fitted.A UK type 13 amp plug is fitted for Eire. Other types of plugs can be fitted on request. We manufacture in the UK. RoHS compliant. Based on the information provided by our by our component manufacturers, the Vortrak does NOT contain the substances restricted by the RoHS legislation at levels over the maximum concentration values. Four track controller manufactured from quality components tested to 105 degrees centigrade. Suitable for '00' 'H0' and 'N' gauge layouts. Output: 4 x 12 volts DC at 1.1 amps protected all controlled. 2 x 12 volts DC accessory outputs protected by 1 amp circuit breakers, both uncontrolled. On-board Capacitor Discharge Unit (CDU) for points motor operation. Wiring diagram supplied. Can be supplied with European 2-pin or Shuko mains plug top.